Elliptical bikes offer a different workout for your body than a treadmill. But the challenge is to find an elliptical machine that can match what you find at the gym. Elliptical machines can be bulky and non-portable. An elliptical can be noisy too. This elliptical machine can match what you find in the gym. It offers a smooth stride, almost like running, among other cool features. This is a great product if your main aim is to lose weight. Why? This machine can support weight up to 400 lbs. Most machines barely reach 300 lbs, so this is a major plus. A heart rate monitor with a chest strap. It’s much more reliable than just a pulse grip reading. The stride length on this machine can go up to 22 inches. You can use a pre-built program to work your heart or leg muscles. Backlit LCD display, a built-in fan, a water bottle holder, and a sound system. The pedals are roomy with 15 inches in width. The built-in fan is the drawback because it doesn’t do much. The drive system is really quiet. You can enjoy fluid motion without any annoying noises. This machine might scrape the floor so you need to place it on a mat or a carpet. Also, the monitor system is flimsy and might not last. Other than these issues, this is possibly the best elliptical bike for consumers. You can use this elliptical bike either sitting or standing. But that’s not the only cool thing about it. This elliptical bike has an adjustable tension control system. You can control the intensity level of a workout easily. The foot pedals have reverse motion activity. You can peddle backwards to exercise different parts of your leg muscles. This elliptical bike has a fitness monitor display. It’s rather standard with strides per minute, total workout time, calories burned, and similar information is displayed. The foot pedals are textured. Each also has a non-slip endcap to optimize safety levels of using this machine. The pedals are made from high-quality steel as well. Overall, the construction is very sturdy. This machine is also highly portable. It’s perfect for apartment dwellers with limited space. This elliptical machine doesn’t have any standing support. There’s nothing to hold onto when using. You will have to balance yourself when using this machine while standing. Or you can use a regular chair at home to sit down when pedaling. Obviously, self-balancing is not possible for some people. This machine might not be for you if you are older. Another annoyance with this machine is that it makes a rubbing noise when in use. But that’s just a minor issue. For the given price, this machine is a total bargain. 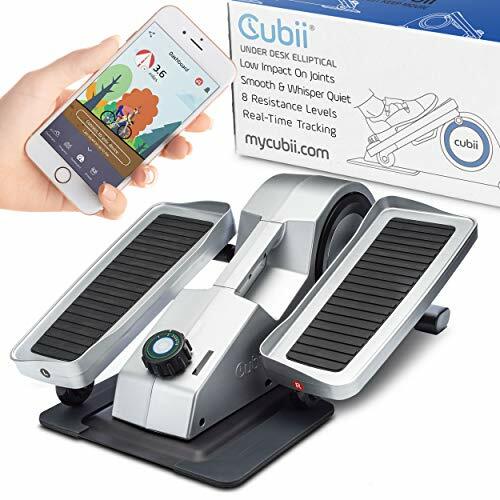 The Cubii Pro comes with an impressive promise of letting users burns 150 calories per hour. Regardless whether you actually believe in it, this desk elliptical would certainly get you moving. This elliptical bike is Bluetooth enabled. It comes with its own app to monitor fitness statistics and plan workout program. You can use the app with an iPhone 5 and above or Android 4.4 and above. This elliptical bike offers a number of resistance levels. This machine is a great option for those who want to build muscle. That being said, this is a desk elliptical bike. It’s really compact and can be placed discreetly under any desk. The machine is designed to ensure optimal comfort. The biking motion is smooth and won’t cause any joint pain. This elliptical bike is recommended to be used while sitting down. There are no handlebars to support riding standing up anyway. This machine works very quietly too. The only major drawback is the price, which is a bit above what’s average for a desk elliptical. All in all, this product is well worth the money. It’s unique and you won’t find many similar to this. Fitness Cubed, Inc. - Misc. This is a full-size elliptical bike that will not disappoint. It’s more expensive than desk elliptical bikes, but it’s well worth the price. The resistance this machine delivers compared well against gym-grade machines. There are up to 20 levels of resistance! 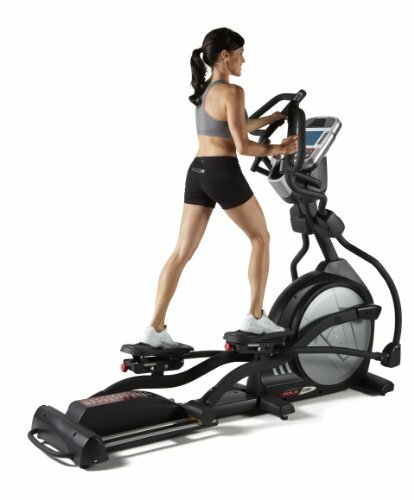 This elliptical bike comes with 22 pre-built programs. There are programs to control your heart rate, test fitness, and custom design workouts as well. The bike’s precision path is 20 inches in length. The ramp can be manually adjusted into 6 positions. The machine is designed with a weighted perimeter flywheel to create the biking motion. So the motion is smooth and quick to accelerate. It’s got a dual LCD displays with complete fitness tracking capabilities. It’s also well optimized for comfort and entertainment. An adjustable fan, a USB charging port, in-console speakers, an MP3 outlet, and a medial shelf. The wheels are rubber coated. These can start shredding with constant use. It comes with a warranty for these issues. But that only lasts 9- days, which is a major bummer. Elliptical bikes are expensive. So when you buy one, you should keep the following in mind to make sure your money is well spent. A full-size elliptical bike is what you usually see at gyms. It’s a biking machine with handlebars and sometimes a seat. These machines have full LCD displays. Importantly, these machines can support your weight safely while standing up. Full-size elliptical bikes offer great resistance training. Most have intensive cardio programs as well to really sweat out the calories. While these machines are great at the gym, they might be too bulky for homes. Also, you will have to spend quite a bit on a full-size elliptical bike. Desk elliptical bikes are a stripped-down, compact version of the full-sized model. These bikes don’t have handlebars or upper body support. Instead, these bikes just have the part that creates the biking motion. The recommended method to use a desk elliptical is while sitting down. Because the desk elliptical machines don’t have handlebars, you won’t have any support while standing up. You will have to balance yourself while using the machine. 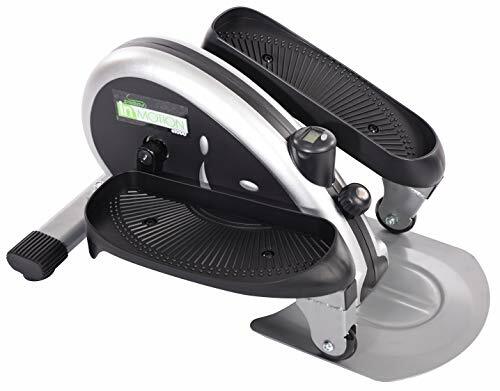 Some desk elliptical bikes can slip when someone is using the machine due to weight. On the flip side, these machines are highly affordable. The resistance simply refers to how hard the bike is to ride. The resistance is created by the mechanisms of the pedaling motion. Resistance can also be created by adjusting the size of the ramp. 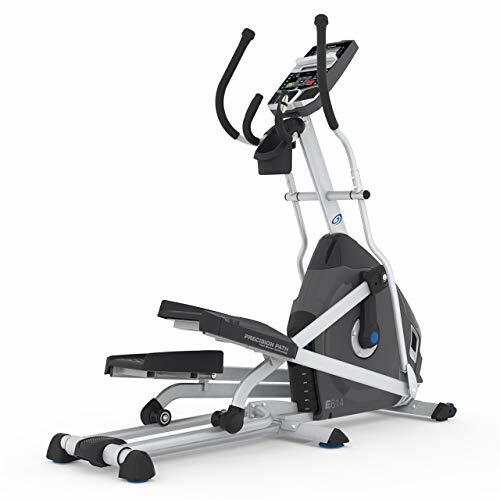 A high number of resistance levels means you are looking at a good elliptical bike. The stride refers to how long it takes to do a complete biking motion with one foot. The longer the stride, the smoother and more challenging the elliptical bike will be. Stride length essentially determines who well you exercise on the bike. Therefore, make sure to look at this spec when purchasing. The pedals of the elliptical machine should be roomy and have non-slip surfaces. A roomy pedal is very important for safety as well. You can check the pedal size of any machine in a detailed product description. It should be at least 20 inches to be safe. Don’t buy a desk elliptical bike if you need upper body support. These don’t have handlebars like at the gym. Fitness tracking capabilities with enhance the functionality of the machine. Therefore, look for at least a heart rate monitor when buying. Don’t forget to always check the maximum weight supported before making a purchase. Double check warranties to make everyone is on the same page. Buying an elliptical bike would offer you excellent value if you heed the above suggestions. When it comes down to it, your research will determine how good your purchase would be. Consider your needs first and then choose the machine of your choice. You can buy either a desk elliptical bike or a full-sized one depending on your budget. Choose a machine that offers excellent resistance to build muscle and lose weight. Protect your purchase with a great warranty, too.